On a recent morning at Westlake Middle School in Oakland, longtime band teacher Randy Porter keeps a friendly demeanor while wrangling his students' attention. "Turn to page 17," he says, projecting over a cacophony of sixth graders messing with their flutes, clarinets, trumpets and saxophones. "Here's the thing: with a little bit of focus, you could get every line sounding that good. I know you could. Or actually, even better!" Porter's encouragement gets a boost in his next class, for seventh and eighth grade advanced band students, when local trumpet player Christopher Clarke joins him. 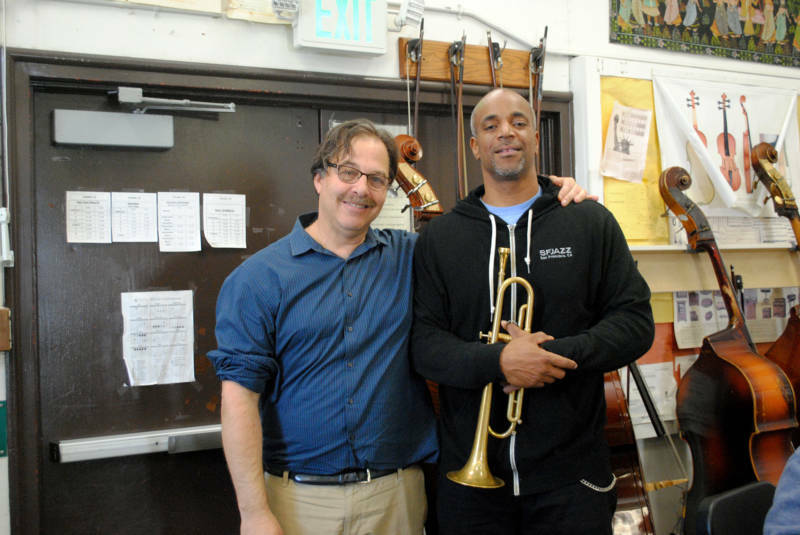 Clarke is a teaching artist who's here thanks to San Francisco nonprofit SFJAZZ's program Jazz in Session, which brings professional musicians into classrooms to work one-on-one with students. As Porter leads the class through a 12-bar blues composition, Clarke brings three trumpet players into a glass-paneled practice room for a special session. With Clarke here, the atmosphere changes; the students seem more engaged, and Porter seems relieved. "I feel like the biggest part of my job is psychologist. I gotta teach music, but there's a lot more," Porter says when he gets a moment to break away from his class. "More than half of our students come from a traumatic home life." SFJAZZ has had a presence in San Francisco public schools since 1984, but this year marks its major expansion into Oakland, with the goal of reaching all of the city's middle schools. 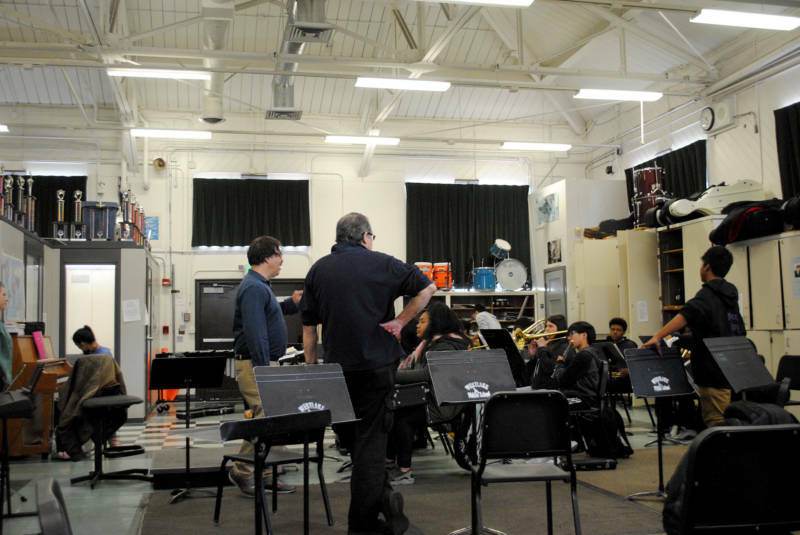 Along with fellow San Francisco nonprofit Women's Audio Mission — which opened an Oakland location for its middle school after-school program this school year — SFJAZZ joins several Oakland music nonprofits, including Oaktown Jazz and Oakland Public Conservatory, in bolstering underfunded music programs in the Oakland Unified School District. Last fall, SFJAZZ introduced Jazz in Session — where teaching artists like Clarke visit music classrooms — to three Oakland middle Schools: Westlake, Montera and Edna Brewer. In the coming 2018-19 school year, SFJAZZ plans to implement two more education programs in Oakland: one of them, School Day Concerts, will bring musicians like bassist Marcus Shelby and Latin jazz ensemble La Mixta Criolla to perform for assemblies at 15 different schools. SFJAZZ Director of Education Rebecca Mauleón says she hopes SFJAZZ's efforts will bolster the arts in the low-income school district, which has about a third of students living below the poverty line. The primary aim is to contribute to students' over all academic success, not necessarily to put them on a direct path to professional musicianship. "The arts are necessary skill-building tools that are part of critical thinking, collaborative learning and, in many cases, the types of job opportunities they'll have in the future that haven't been invented yet," Mauleón says. SFJAZZ' goal is to bring consistency to OUSD's music programs at a time when the district faces a major budget crisis. According to the latest available data from the Rand Corporation, Oakland Unified School District (OUSD) spent $13,813 per student during the 2016-17 school year. (In comparison, across the Bay in affluent Palo Alto, the school district spent $17,941 — over $4,000 more — per student.) Moreover, in December 2017, OUSD approved $9 million in mid-year budget cuts, nixing dozens of non-teaching staff positions and reducing budgets for supplies, teacher benefits and other areas. Fillmore Rydeen, the manager of visual and performing arts at OUSD, says OUSD hasn't laid off any music teachers in years, but admitted that there have been operational cuts to music: "Money we’d use to purchase instruments, supplies and things like that; repair equipment," he says. Like several other teachers at Westlake, Porter maintains that traditional public schools have taken a major hit over the past decade as a result of the charter school movement. Charter schools attract high-achieving students from well-off families out of public schools like Westlake, he says, leaving students from low-income families behind. In 2013, Westlake had 747 students. Porter says that number is now closer to 360. Because schools get funding based on average daily attendance, they've lost many resources. The principal cancelled Porter's before-school jazz band period because of low enrollment, for instance, which cut the time he gets with his advanced students in half. "We have this new era of segregation in Oakland schools," he says. At Westlake, teachers are stretched thin, Porter explains, which is why non-profit programs that send in teaching artists like Clarke can be a huge boon: "There are so many kids that have so many needs in a community like this that to be really successful is not a one-person job." Like SFJAZZ, the San Francisco-based Women's Audio Mission (WAM) is also seeking to deepen its relationship with Oakland schools. The nonprofit has offered after-school programs on site at Oakland schools for nearly seven years, and it opened its first Oakland facility in the Fruitvale district at the start of the 2017-2018 school year. 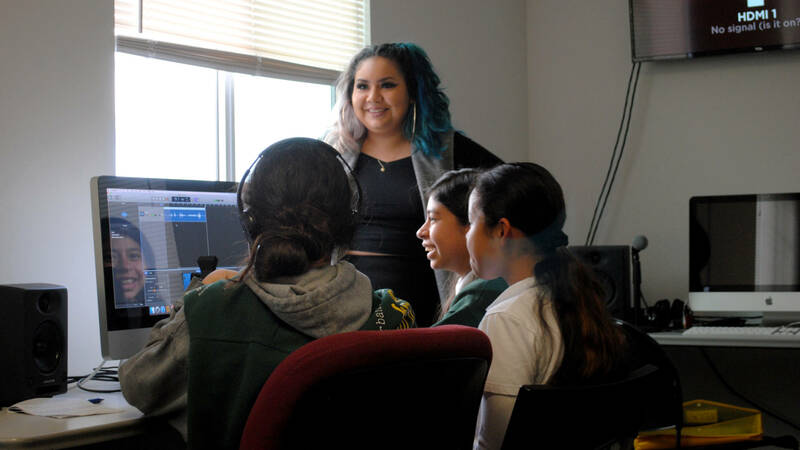 "We've had next-to-no capacity to offer audio engineering course work for our middle school students, so having someone like Women's Audio Mission is something that's really critical and fills a variety of different roles in music education," says Rydeen. As of 2017, the Oakland Unified School District has a 35 percent dropout rate, and Terri Winston, founder of Women's Audio Mission, says that phenomenon is particularly prevalent in East Oakland. She set her sights on Fruitvale in order to reach those under-resourced students. "This location in particular, there's like eight middle schools that can walk to us," says Winston. "It was important to us to have a location that the girls could own, that felt like, 'This is a part of my neighborhood.'" When I sit in on a class called Girls on the Mic on a recent afternoon, over a dozen sixth-grade girls from Urban Promise Academy work on podcasts in GarageBand. Most of them are bilingual English and Spanish speakers, so there's a lot of Spanglish in the mix. One group of three giggles as they practice the introduction to their gossip podcast, which they're calling Middle School Chisme. Another group passionately huddles around their microphones for a podcast on LGBTQ issues. "I don't know what I am yet," one student confesses into the mic, "but I think everyone should be themselves!" 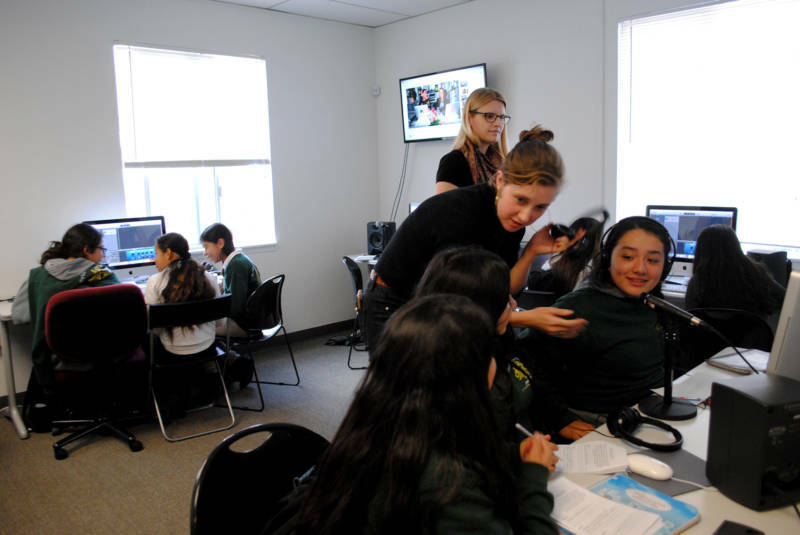 At Girls on the Mic, kids learn a wide range of skills, including recording, mixing, music production, sound for film, podcasting and live sound. "They kind of get to pick and choose and get exposed to all of these careers," says Victoria Fajardo, a Girls on the Mic instructor. Fajardo says that as a woman of color, her passion to inspire young girls in Fruitvale is deeply personal: she's first generation Mexican American and grew up in a similarly working class, predominantly Latino neighborhood in Concord. "It's really important for me to tell them, 'If I can do it, you can do it,'" she says. As class wraps up, the girls look invigorated; they're still giggling from having fun being themselves on the mic. Winston says that experiences like this can help close the achievement gap by motivating students to get excited about learning. Her goal is to reach 3,000 Oakland students a year by 2020. "They can see how this ties into their current studies," she says. "And then: 'Oh, maybe my current studies aren't that bad if I can use them to make this badass art.'"